** So the new designation for murder is "non-accidental" death. Has the Public Prosecution Service not heard of DNA testing and other forensic investigations? If this is the best they can do, it is shameful and a disgrace. The Public Prosecution Service has said it is standing by its decision not to prosecute two people in connection with a toddler's "non-accidental" death. Liam Gonzalez Bennett, from Ballymena, County Antrim, died in February 2009. 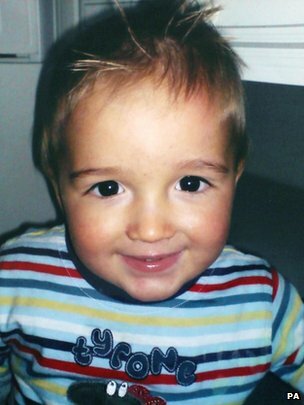 A pathologist told his inquest that the 20-month-old was beaten so hard that he was left blind minutes before he died. In a review of its decision not to prosecute, the PPS said that while the child died due to non-accidental injury, there was not enough evidence. It said it had concluded the the original decision not to proceed against either or both of the individuals reported to it should stand. Liam's injuries were discovered when he was found unresponsive in his cot while his mother, Samantha Bennett, was out shopping. Her fiancé at the time, Noel McKeown, was looking after the boy and his older sister at the couple's home in Sunningdale Park. Mr McKeown said he found that Liam was not breathing and called the child's mother and then an ambulance. Liam was taken Antrim Area Hospital before being transferred to the intensive care unit at Belfast's Royal Victoria Hospital, where he died the following day. He had sustained 31 bruises to his head that medical experts told his inquest were consistent with being punched. Marianne O'Kane, Regional Prosecutor of PPS Eastern Region said: "There has been a thorough review of all the available evidence and information in this case, arising from both the police investigation into the death of baby Liam and following the conclusion of the inquest into the circumstances of his death. "While it is clear that baby Liam's death was as a result of non-accidental injury, the evidence available is not sufficient to establish the identity of the person or persons responsible for causing that injury," she said. In 2013, an inquest recorded a verdict of non-accidental death and the coroner said it was disturbing that no-one had been held accountable. She sent a file to the PPS. Liam's mother, Samantha Bennett, told the inquest she could not give any explanation as to how he sustained his injuries. She described how she had returned home from a shopping trip to find ambulance crews working on her unconscious child. The inquest was told that Ms Bennett and her former fiancé were interviewed by police on at least three separate occasions but offered no explanation for the injuries. "I assure the public that every care has been taken in this case. We have worked closely with police and the evidence has been exhaustively examined and reviewed by senior lawyers within the PPS," Ms O'Kane said. "Those involved in this case have been informed of the outcome of the review and also of the fact that the case may be re-opened should any relevant new evidence or information become available in future." This page was loaded Apr 25th 2019, 10:30 pm GMT.